A payment for service done or to be done, usually for professional or special services, the amount being usually fixed by law or custom. The duties discharged by the Levites in connection with the service of the Tabernacle and, afterward, of the Temple were compensated by the tithes of Israel. The priests in their turn received a tithe of the income of the Levites, as well as a number of gratuities known under the name of "the twenty-four gifts of the priesthood" (Tosef., Ḥallah, ii. ; "Aruch Completum," s.v. ). Samuel took naught of any man's hand (I Sam. xii. 4). Elisha refused to accept anythingfrom Naaman, the Syrian captain, for curing his leprosy, and cursed Gehazi for taking a gift (II Kings v. 16-27). Yet Elisha did not object to the furnished chamber prepared by the Shunammite; from which the Talmud deduces that one may accept a gratuity, although the prophet Samuel taught otherwise by carrying his household with him whenever he traveled (Ber. 10b) so as not to be dependent on others. 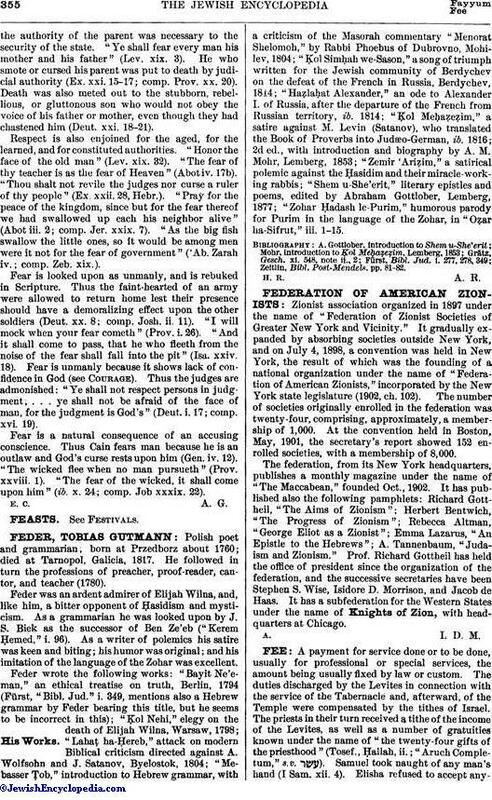 The learned professions were not strictly defined in Talmudic times, and the Rabbis treated the laws pertaining to them under the laws of master and servant. While a learned man need not reject a favor or benefit, he must not demand payment for teaching the Law. Moses said: "Behold I have taught you statutes and judgments even as the Lord my God commanded me" (Deut. iv. 5). All must follow the example of God and of Moses and teach without reward. However, a primary-school teacher may charge for taking care of children, or for instruction in the accents and the division of verses (B. B. 37a). Maimonides allows the customary price for teaching the Scriptures, but not for the common law ("Yad," Talmud Torah, i. 7; compare Shulḥan 'Aruk, Yoreh De'ah, 246). Nevertheless, the student must hire a teacher, even if he can not obtain free tuition, as the Proverbs say: "Buy the truth and sell it not" (xxiii. 23). R. Zadok said: "Make not the Law thy hoe . . . for whoever derives a benefit of the Law loses his life in the world to come" (Abot iv.). R. Tarphon, accused of theft and in danger of being thrown into the river, saved himself by revealing his identity; an act which he regretted all his life as an unworthy use of the respect paid to him only as a scholar. Jonathan b. Amram, a disciple of Rabbi Judah, would not make himself known in order to share in Judah's distribution of food to scholars at a time of famine, but begged to be fed like a dog or a crow (B. B. 8a). In Temple times teachers were appointed to instruct the priests in the details of the service, and they received a stipulated sum from the Temple treasury (Ket. 106a). The physician, although frequently looked upon as a communal official (see Health Laws), seems not to have received any fixed salary, but to have maintained himself by casual fees. The fee incidental to an illness caused by an assault was collected from the assailant, who was also obliged to make a further payment in compensation (see Damage; Tort). The fee in this case, as in the case of hired service, if not determined previously, was regulated by legal custom (see Hiring and Letting). Attorneys at law were unknown to Jewish jurisprudence and those who assumed their functions were regarded with suspicion by the Rabbis (see Abot i. 8; comp. Shab. 139a). The attorney who was authorized to represent his principal for the purpose of receiving property from a bailee or trustee was regarded as an agent, and the principal was obliged to pay all his expenses (B. K. 70a). There was no provision for his fee, which was probably regulated by the general customs of hiring and letting (see Attorney; Master and Servant). The scribes of the court of justice or of the Temple received an annual salary (Ket. 106a; comp. Shab. 56a). There were, however, private notaries who drew up deeds of sale, bills of marriage or divorce, promissory notes, and other legal documents. They received a special fee for each service rendered. The general principle was that the party to whose advantage the transaction was presumably made should pay the scribe's fee. Thus the borrower paid the fee for the preparation of a promissory note, the buyer for the deed of sale, the hirer or tenant for the lease, and the bridegroom for the engagement or marriage contract. The fee for documents prepared in connection with the litigation of a case that came up in court was divided equally between the litigants (B. B. 167b; Maimonides, "Yad," Malweh, xxiv. 2). The judge was forbidden to take any fee for rendering judgment; the decisions of a judge who accepted a, payment should be considered void (Bek. 29a). The rendering of judgment was regarded by the Rabbis as teaching the Law, for which no payment might be accepted. But a judge was permitted to demand payment for loss of time, which payment was shared equally by plaintiff and defendant. Thus Karna, a justice of Babylonia, accepted a zuz from both the complainant and the defendant, explaining that he merely took his usual fee as a connoisseur of wine. Another justice, R. Huna, when the litigants appeared before him, said: "Pay me for the hire of a man to irrigate the field in my place, and I will sit in judgment" (Ket. 105a). Those judges who were appointed by the community and had no other occupation might take a salary from the communal treasury (see "Yad," Sanhedrin, xxiii. 5; Ḥoshen Mishpaṭ, 9, 3). In Temple times the magistrates of Jerusalem ( ), whose duty it was to guard the public safety, received an annual salary from the Temple treasury ("terumat-ha-lishkah": Ket. 105a). There is no mention made of the salaries which the members of the Sanhedrin, or the city or government officials, received. Later, when communities chose permanent ministers, whose duty it was not only to decide questions of ritual, but to render judgment in civil cases, it became customary for both parties to pay a fee to the minister for the decision rendered. In spite of the opposition of many authorities to this custom, it remained in force and is still practised. In the Orient, however, and particularly in Jerusalem, the custom still prevails not to charge the litigants anything. 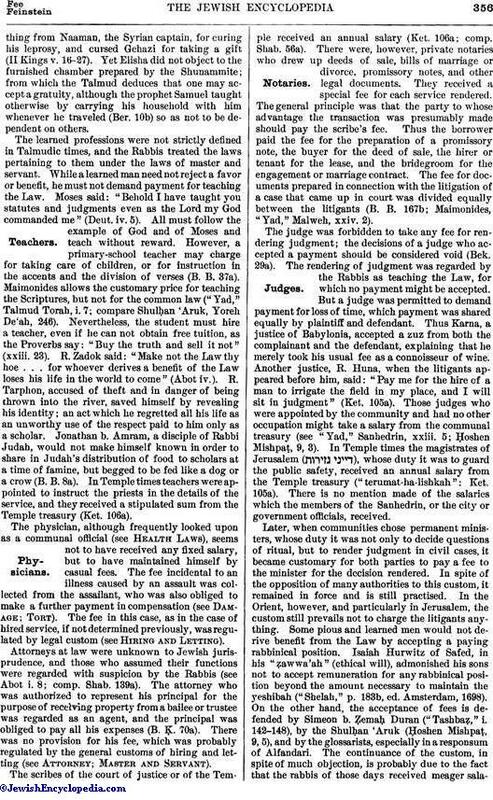 Some pious and learned men would not derive benefit from the Law by accepting a paying rabbinical position. Isaiah Hurwitz of Safed, in his "ẓawwa'ah" (ethical will), admonished his sons not to accept remuneration for any rabbinical position beyond the amount necessary to maintain the yeshibah ("Shelah," p. 183b, ed. Amsterdam, 1698). On the other hand, the acceptance of fees is defended by Simeon b. Ẓemaḥ Duran ("Tashbaẓ," i. 142-148), by the Shulḥan 'Aruk (Ḥoshen Mishpaṭ, 9, 5), and by the glossarists, especially in a responsum of Alfandari. The continuance of the custom, in spite of much objection, is probably due to the fact that the rabbis of those days received meager salaries,the fees being necessary to their maintenance. The fee was not regulated by law or custom, but was left entirely to the good will of the parties interested (Ḥoshen Mishpaṭ, 9, 5; Pitḥe Teshubah, ad loc. ; Ḥatam Sofer, Ḥoshen Mishpaṭ, 164; Shebut Ya'aḳob, i. 142). Fees were also given, notwithstanding the opposition of many authorities, for the performance of a marriage ceremony, the arrangement of a divorce or a ḥaliẓah, or for the performance of other religious functions. 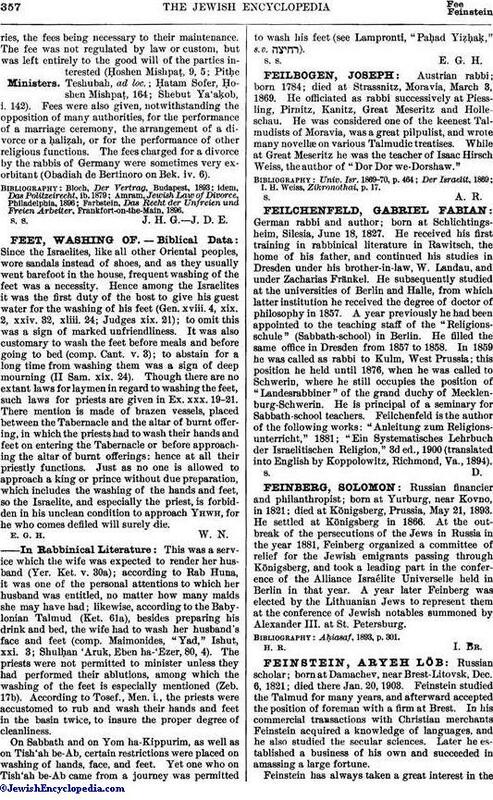 The fees charged for a divorce by the rabbis of Germany were sometimes very exorbitant (Obadiah de Bertinoro on Bek. iv. 6). Farbstein, Das Recht der Unfreien und Freien Arbeiter, Frankfort-on-the-Main, 1896. S. S. J. H. G. J. D. E.